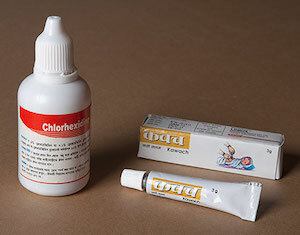 Chlorhexidine, a low-cost antiseptic, prevents deadly infections that enter an infant’s body through a newly cut umbilical cord. Few other interventions have as much promise to rapidly reduce newborn deaths at an affordable price—less than $1 per dose. This year, 7.1% chlorhexidine digluconate was added to the WHO Model List of Essential Medicines for Children.